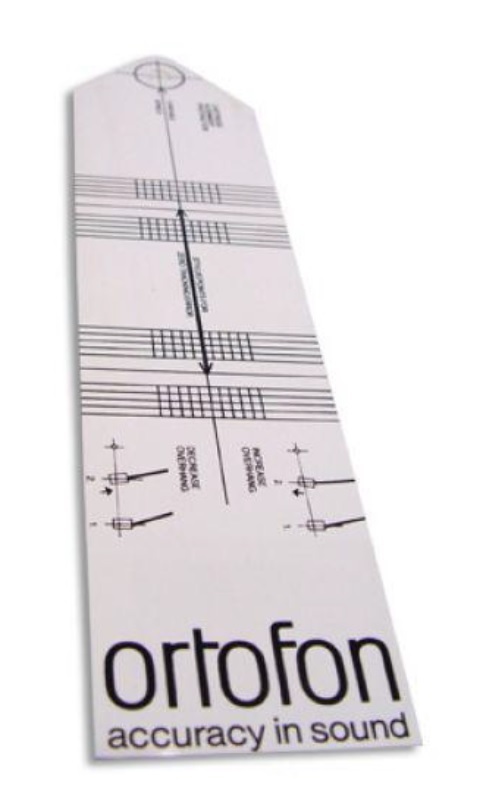 An alignment protractor is used to find the correct distance from stylus tip to tonearm pivot. When aligning a cartridge for tangency using the alignment protractor, it is essential to remember that you are attempting to align the cantilever (and, hence, the stylus), not the cartridge body. There is no guarantee that the cantilever is perfectly aligned within the cartridge body, so simply aligning the cartridge body will not necessarily produce the desired result. Furthermore, many cartridge bodies have non-parallel sides, making tangential alignment of the cartridge body with the lines of tangency on the gauge virtually impossible. An alignment protractor is a plastic template onto which are printed the null point(s) and lines of tangency against which the cartridge should be aligned. The template is placed over the turntable's spindle (made possible via a spindle-sized hole drilled in the template) and placed against the platter. Cartridge must be adjusted until the cantilever is parallel to the set of parallel lines. And this should be achieved for both the indicated points. When the cartridge's longitudinal axis is parallel with the horizontal lines, tracking error will be at a minimum.